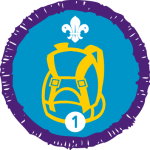 The Hikes Away Staged Activity Badge is earned by taking part in hiking activities within Scouting. The difficulty and challenge faced will vary depending on what section you are in for the activity to count towards the badge. The Hikes Away Staged Activity Badge is earned after completing 1, 2, 5, 10, 15, 20, 35, and 50 hikes.